Recently we found a cross-platform word gaming app that got our whole office addicted and stunned. Trivia Search is the one we're talking about. Brought to both Android and iOS users by BigBelly Productions, this game is designed with challenging gameplay, intuitive user interface, great graphics and interesting sound effects. 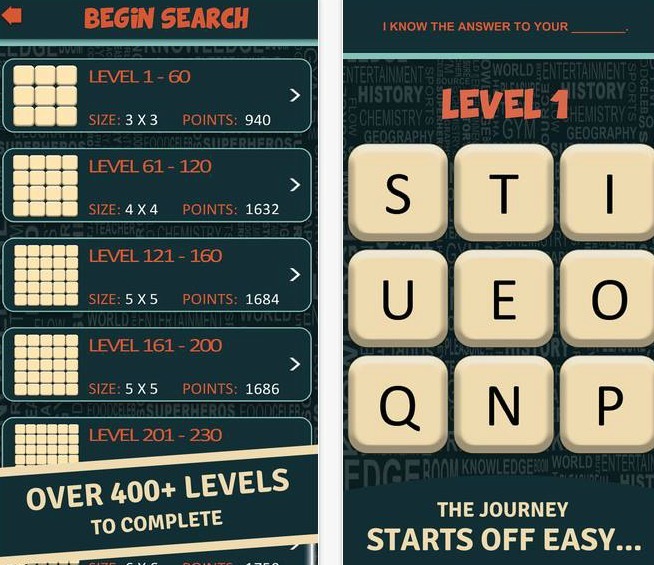 If you are a crossword, trivia and word search lover, the Trivia Search is the perfect solution to have some fun. When you start it, you will think that its gameplay is easy, but as you advance it will get more difficult and challenging for you. There are over 500 levels with different difficulties that can increase your brain and thinking skills and put you to an ultimate brain test. Solve the anagrams, the word puzzle and the quiz questions, exercise your brain and try to win as many levels as you can. Answer the trivia questions, find the words that are hidden in the puzzle grids and earn many rewards to help you complete the levels. Trivia Search combines trivia, word search and crossword in one place, bringing you all kinds of topics, such as arts, animals, riddles, history, food, quotes, anagrams, basic general knowledge, etc. It also features some in-app purchases, so you can purchase 20, 45, 125 and 200 hints to help you out. Download it today for free from Google Play or from the App Store.